America Online's Netscape team has opened its doors to the public, releasing the first beta of the revived Netscape Web browser. Based upon Firefox, Netscape version 8 focuses on security and protecting user privacy, and supports rendering with both Mozilla's Gecko and Microsoft's Internet Explorer browser engines. In January, a minor update to Netscape brought the browser's code base up to Firefox 1.0. AOL did not have time to incorporate Firefox's recent 1.0.1 changes into the beta release, and acknowledges, "The deficiencies noted in Firefox 1.0 are inherited in Netscape 8 Beta in most cases." In addition to changes under the hood, AOL's Netscape team has made numerous modifications to the browser's outside. A new skin has been developed for the beta, along with other usability improvements. To reduce browser clutter, Netscape has included a "Multibar" feature that combines up to 10 customizable toolbars into single buttons. Users can create their own toolbars with RSS feeds, or use the included toolbars that feature content from AOL's media properties. Designed to protect Web surfers from scams and viruses, a new "Trust Rating" system helps to warn users of potentially dangerous sites. AOL says it "continuously updates the browser with a list of trusted and suspected sites" and "will automatically apply your security settings to make you safer and more compatible." If Netscape 8 encounters a blacklisted site, it will first display a page warning the user. Blacklisted URLs include phishing, spyware and virus laden sites. "Sites that are neither whitelisted nor blacklisted (the majority of sites on the Web) will render in Firefox with cookies, Java, etc. activated -- but ActiveX off -- for maximum security. If a page doesn't render or work properly, the user can flip it to IE with a single click," a source said. 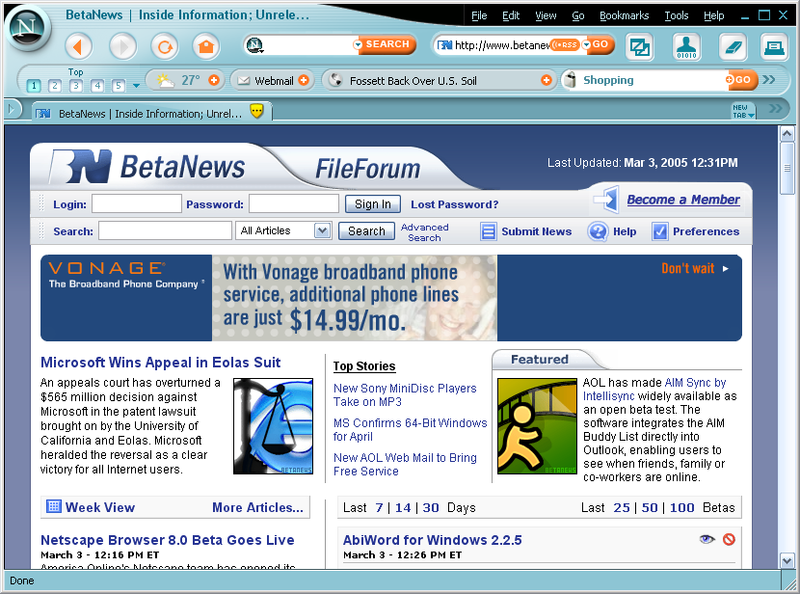 Netscape Browser 8.0 Beta is available for download from FileForum.